About Volktek Corporation - Products, News and Contacts. Starting in 1994, Volktek focuses on R&D and production of a variety of network products and is a leading manufacturer of these devices in Taiwan. 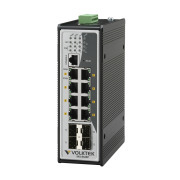 Volktek also provides industrial optical Ethernet solutions for high-quality long-distance data transmission . SEN-9425P-24V-RW is an unmanaged PoE+ switch with five Gigabit ports and two 100FX/Gigabit SFP slots. It is built with industrial-grade components, enclosed in IP30 aluminum casing, and designed to withstand vibration, shock, free fall, and temperatures ranging from -40°C to 75°C. IEN-8408P-24V is an unmanaged PoE+ switch. It is built with industrial-grade components, enclosed in IP30 aluminum casing, and designed to withstand vibration, shock, free fall, and temperatures ranging from -40°C to 75°C. IEN-8608PA-24V is a managed industrial switch with eight PoE+ compliant 10/100/1000Base-T ports. It is built with industrial-grade components, enclosed in IP30 aluminum casing, and designed to withstand vibration, shock, free fall, and temperatures ranging from -40°C to 75°C. 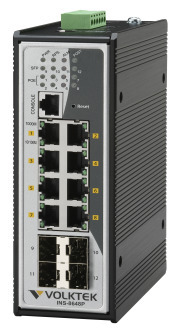 IEN-8648PA is a managed industrial switch with eight PoE+ compliant 10/100/1000Base-T ports and 4 Gigabit SFP slots. It is built with industrial-grade components, enclosed in IP30 aluminum casing, and designed to withstand vibration, shock, free fall, and temperatures ranging from -40°C to 75°C. 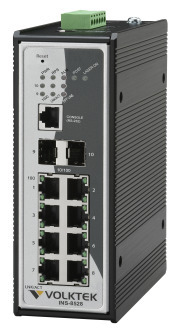 IEN-8608PA is a managed industrial switch with eight PoE+ compliant 10/100/1000Base-T ports. It is built with industrial-grade components, enclosed in IP30 aluminum casing, and designed to withstand vibration, shock, free fall, and temperatures ranging from -40°C to 75°C. SEN-8428PL-24V is a Lite managed industrial PoE+ switch with eight 10/100/1000BASE-T and 2 SFP ports. It is built with industrial-grade components, enclosed in IP30 aluminum casing, and designed to withstand vibration, shock, freefall, and temperatures ranging from -10°C to 60°C. SEN-8425PL-24V is a Lite managed industrial PoE+ switch with five 10/100/1000BASE-T and two SFP ports. It is built with industrial-grade components, enclosed in IP30 aluminum casing, and designed to withstand vibration, shock, free fall, and temperatures ranging from -10°C to 60°C. SEN-8405PL-24V is a Lite managed industrial PoE+ switch with five 10/100/1000BASE-T ports. It is built with industrial-grade components, enclosed in IP30 aluminum casing, and designed to withstand vibration, shock, free fall, and temperatures ranging from -10°C to 60°C. SEN-8428PL is a Lite managed industrial PoE+ switch with eight 10/100/1000BASE-T and 2 SFP ports. It is built with industrial-grade components, enclosed in IP30 aluminum casing, and designed to withstand vibration, shock, free fall, and temperatures ranging from -10°C to 60°C. SEN-9425P-24V-SS is an unmanaged PoE+ switch with five 10/100/1000Base-T ports and 2 Gigabit SFP slots. It is built with industrial-grade components, enclosed in IP30 aluminum casing, and designed to withstand vibration, shock, free fall, and temperatures ranging from -40°C to 75°C.